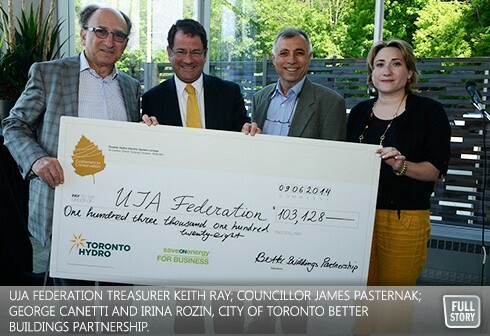 By Daniel Horowitz--On June 9th UJA Federation of Greater Toronto received the Customers for Conservation award from both the Better Building Partnership and Toronto Hydro. This award recognizes the organization’s leadership in energy conservation at its Bathurst Street headquarters, the Lipa Green Centre, located on Sherman Campus. By retrofitting the building’s heating and cooling systems with the latest energy-efficient chiller technology, UJA will see annual electricity savings of 295,881 kWh, the equivalent to saving approximately 932 trees. This is one of the largest energy efficiency projects in the social sector participating in the saveONenergyOM program. Additional projects now underway include retrofits to lighting and heat pumps for even greater energy reductions. The savings can now be reinvested in community programs. “UJA Federation was originally approached by the City of Toronto to explore opportunities to utilize the programs and grants available from the both City and Toronto Hydro to improve the energy efficiency at the Lipa Green Centre and reduce our carbon footprint,” says Stephanie Olin Chapman, B. Arch., MBA, Facilities Development, Jewish Community Properties of Greater Toronto - UJA's real estate group. “We were also asked to take on a leadership role in promoting the program to other organizations in the Jewish Community.” As UJA Federation embarked upon its own retrofit project, staff convened an information session at the Lipa Green Centre, inviting synagogues and other institutions who own their own buildings to use UJA’s experience as a case study and learn more about the resources and funding available to them for projects that can significantly reduce their ongoing operating costs. This led to several organizations taking on their own retrofit programs. “The exciting part of these programs is that not only do they contribute to reducing our environmental footprint, but the ongoing costs savings frees up valuable funds for mission driven programs,” added Olin Chapman. And, by promoting green practices at the Lipa Green Centre, not only is UJA Federation lightening their carbon footprint and significantly cutting energy costs, it is honouring a basic Jewish value – tikkun olam – to repair the world. “As a responsible greening organization, UJA Federation of Greater Toronto is proud to take part in the SaveOnEnergy program for a number of reasons,” said UJA Federation Treasurer, Keith Ray. UJA Federation encourages business owners and property managers to take advantage of saveONenergyOM incentive programs by contacting Toronto Hydro’s Energy Experts at cdm@torontohydro.com. Some programs are due to expire at the end of 2014 so customers are urged to get applications in as soon as possible.